CNN Geek Out: So how did this one come about? McDaid: I get quite a few commissions like this. The last one I did was a "Batman"/"Murder, She Wrote" crossover, which was a lot of fun. I think there are fans out there with a bit of disposable income who want to see the sort of stories the mainstream no longer provides, either 'cause of editorial mandate or copyright restrictions or whatever. This was along those lines. 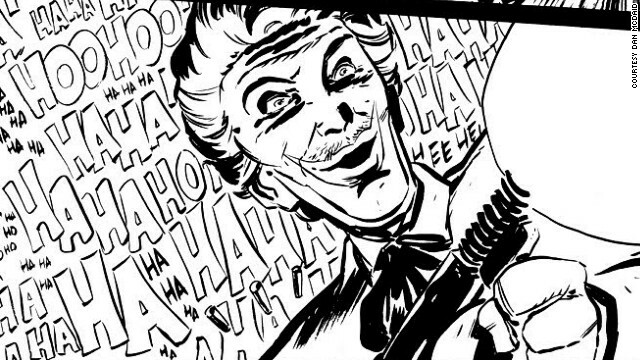 The commissioner asked me to take a scene from the modern "dark" era of Batman and recast it with Adam West and Cesar Romero. I love the old "Batman" TV series, so I was happy to oblige. CNN Geek Out: How long have you been doing these sorts of works? McDaid: A couple of years now, I guess, though I can't think what my first one might have been. I'm a total pop culture nerd, so I love doing them. CNN Geek Out: What is your favorite part about the Adam West and the Christopher Nolan/Christian Bale takes on Batman? McDaid: With Adam West, it's tempting to say it's the campiness or whatever, but that's not really it. I think what's so brilliant about the '60s Batman is his tangibility. He looks kind of like your dad, if your dad happened to be Batman in the 1960s. Does that make sense? He's not wearing super-high-tech body armor, he's wearing tights, silk, plastic. Ordinary materials, things you could find around the house. Despite its high-kitsch, high-color aesthetic, it feels weirdly real. This is going to sound pretentious, but Adam West's Batman is vulnerable in the same way that David Mazzucchelli's Batman is vulnerable. He's just a dude in a cape, and I love that. Christian Bale is the opposite, of course. Nolan's really going for the "Legend of the Dark Knight," so it's all (for all its purported realism), that [much] bigger, more operatic. The Adam West Batman is flesh, the Christian Bale Batman is steel. I like both approaches. CNN Geek Out: Would you describe yourself as a fanboy or a geek? McDaid: Massively, yeah. Primarily for comics, I guess, but like a lot of geeks I'm geeky about everything. TV shows, comedy, music. I like finding out what's going on under the surface, why an artist made the choices they made. When I was a kid, I was crazy about "Doctor Who" (I'm still pretty crazy about it now), and the amount of behind the scenes info about that show was pretty extensive. So that's probably where this madness comes from. CNN Geek Out: Any interesting or strange requests you have had to turn down? McDaid: I don't tend to say no to anything, honestly. I do roll my eyes at some of the more mental suggestions I've had, though I always end up loving them when I'm done. I've got a few on the cards right now that are ... let's say they're eccentric. CNN Geek Out: Anything in the works you can tell us about? McDaid: Yeah! I've got a project (maybe two) coming from Oni Press in the new year. I'm also in early talks with some incredibly cool creators, and if these projects come together, I can probably die happy. And my run of "Doctor Who" strips for [British publisher] Panini is finally being collected as well. I'm really excited about that, because it's all my "Doctor Who" writing in one place, and for a while it looked like it was never coming out. So watch out for "Doctor Who: The Crimson Hand" next year! You can check out McDaid's full sketch here.